Bonjour! Can I offer you a glass of Bordeaux? How about a nice croque-madame, or perhaps just a baguette and some fresh chevre? No? 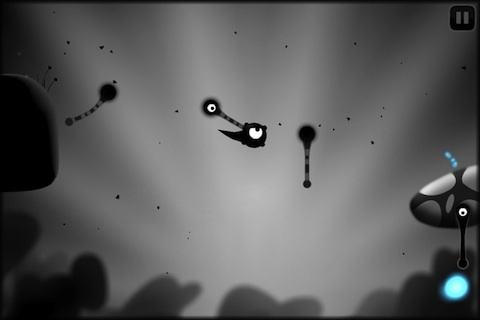 Well at least try this amazing new puzzle game called Contre Jour. Chillingo Ltd, the avant-garde developers that have brought such blockbusters as Angry Birds HD and Cut the Rope have once again taken things to the next level in a beautiful dark new way. Contre Jour allows you to use the touch screen to morph the terrain and navigate a little monsieur named Petit to his goal. The levels are cleverly designed and very innovative. The controls are extremely fluid and easy to learn. On the way you’ll utilize air geysers, stretchy swings, and portals to whimsically swing, blow, and roll your way through the sixty levels (with more coming soon). It’s a shame the game ever has to end, but c’est la vie. “Contre-jour” is French for “against daylight”, used to refer to the silhouette effect that comes from taking a back-lit photograph. The title is quite a propos, as the game has a beautiful black and white (with shades of blue) aesthetic. Such a visual theme may sound like it would give a melodramatic film noir-esque feel, but au contraire; the artistic move establishes a certain calm and tranquil ambiance. An ambiance that would not be possible were it not for the soundtrack. Très Magnifique! Most apps win bonus points for allowing you to play songs from your music library, but I would be yelling “sacrebleu!” if such a feature were included. At the start of the game you are informed that headphones are recommended for a full experience, had I been the creator I would have made it mandatory. The soundtrack includes several wonderfully orchestrated piano songs with exquisite cinematic melodies by composer David Ari Leon. The musical style is all very reminiscent to Yann Tiersen, composer of the soundtrack for acclaimed (French) film Amelie. 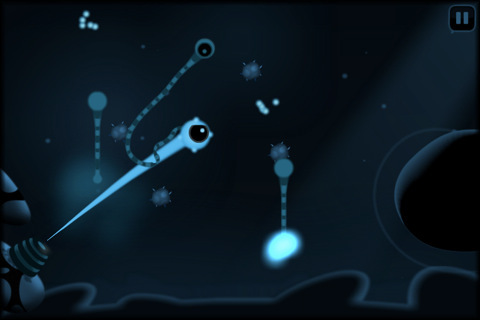 Contre-Jour is the crème de la crème of gaming apps. The visuals, the music, and the gameplay come together to give a certain je ne sais quoi that needs to be experienced to be fully understood. Don’t make the faux pas of missing this delightful game. Now if you’ll excuse me, I’m fairly certain I’ve used every French word I’ve ever known. I bid you adieu. AppSafari review of Contre Jour was written by Neema Akhtar on September 13th, 2011 and categorized under App Store, Featured, Games, Physics Based, Platformer, Puzzler. Page viewed 3034 times, 1 so far today. Need help on using these apps? Please read the Help Page.